Happy 30th anniversary, Sally Ride's first space flight. Happy 30th, Sally Ride’s First Space Flight. You Came Too Late. Sally Ride, the first U.S. woman to travel into space, speaks at the San Diego Aerospace Museum in 2003 in San Diego. Thirty years ago today, Sally Ride became the first American woman to travel into space. When Ride died in 2012, Laura Helmuth paid tribute to her by asking what the hell took so long. Her post is reprinted below. Don’t get me wrong. Sally Ride, rest her soul, absolutely rocked. She was smart and courageous, unabashedly a feminist, and she called out sexism before, during, and after her time as an astronaut. She was a great advocate for science and math education, especially for girls; she wrote science books for kids, and her organization runs science camps and fairs and trains science teachers. The first American woman in space, Ride flew on the Space Shuttle Challenger in 1983. A few years later she helped identify the systematic failures that led to that shuttle’s explosion. When the Columbia disaster killed another batch of astronauts, she served on an accident investigation board again (Ride was the only person to serve on both boards, which must have been incredibly grueling), and then she helped write NASA’s plans for the future of human spaceflight. She arguably contributed more to NASA, and probably the world, than any other ex-astronaut. She was the Jimmy Carter of ex-astronauts, especially compared with Buzz “Show Me The Money” Aldrin or Harrison “Don’t Fret Climate Change” Schmitt. She dedicated her career to science, space, safety, and girls’ education, and I was crushed to hear of her death. Sally Ride in January 1983, five months before her Challenger flight. But back in 1983, when Ride made her historic trip into space, it was already too late. Judging by Google query completions, a lot of people think Sally Ride was the first woman in space. But that was cosmonaut Valentina Tereshkova, who was also the first civilian in space. Do you remember how many years the Soviets beat us by in this particular race? Twenty. Tereshkova piloted the Vostok 6 into space in 1963. The first woman to walk in space was Svetlana Savitskaya, in 1982. By the time Ride got there, we already had a lot of female “firsts,” which made some of the attention lavished on her—what an amazing feat for a woman!—feel a little condescending to, say, a 14-year-old girl in Indiana. Sandra Day O’Connor had just been named to the Supreme Court in 1981—also sadly overdue. Janet Guthrie raced in the Indy 500—one of the most macho, daredevil, balls-scratching sports—in 1977, for crying out loud. And never mind that Amelia Earhart got her pilot’s license exactly 60 years before Ride’s flight. The fact that it took until 1983 to have a female astronaut just emphasized NASA’s nasty history of sexism. The United States could have sent the first woman into space much, much earlier. The Mercury program trained 13 women starting in 1961. They performed well, but despite their skills (or perhaps because of them), the program was eventually canceled. NASA redefined its astronaut prerequisites to include jet fighter experience, thereby ruling out any possibility of female candidates. 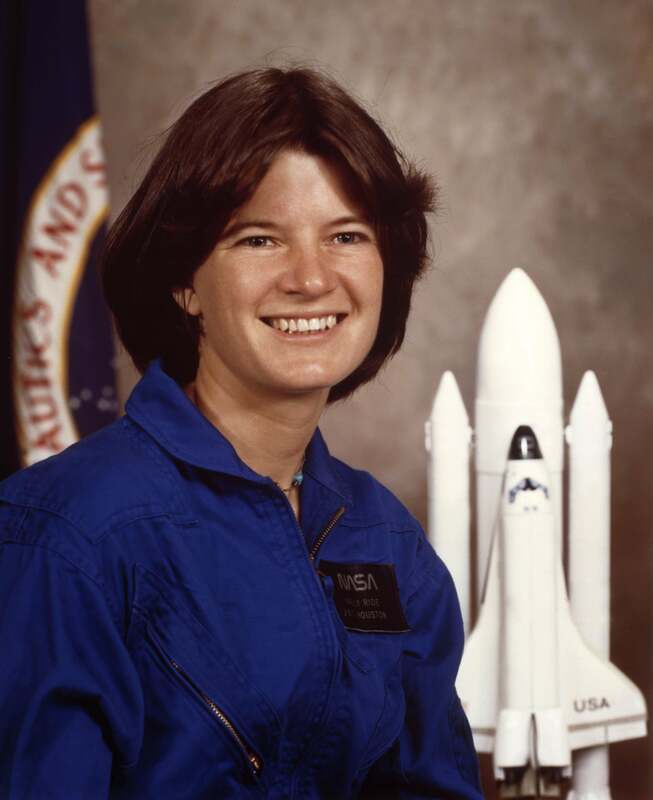 As much as I admire Sally Ride the person, do you know who should have been the first woman astronaut? One of the Mercury 13, definitely—all of whom by the way were honored guests in 2005 when shuttle commander Eileen Collins led the first shuttle flight after the Columbia disaster. But if not them, it could have been Janet Guthrie. She applied to an astronaut training program in 1964 and would have raced circles around those other guys.